Wilson Auto was established in 1986 and still operates out of its original location at 3133 Saturn Road in Garland, Texas, but serves customers from all over the Dallas area, including Allen, Fort Worth, Frisco, Plano, McKinney, Mesquite, Rowlett, Rockwall, and other communities. Like most auto repair shops, we perform professional quality repairs on late model cars, but we also serve classic car owners throughout the area, specializing in Mustangs and other vintage cars. We're honored to have twice been named by AAA as the Top Shop award in the Dallas-Fort Worth area, which is based on customer satisfaction--our 98% rating led all area independent and new car dealers. But you won't really know what sets us apart until you try us. Give us a call at 972-271-3579 and make an appointment to come see us. We'll make you a believer, too. You can also send us an email. We are a small company and we like our size. You'll get personalized service when you come to my shop. Because we are small, we know how important it is to fix every car correctly, which makes our customers happy. I've been around cars my whole life, graduating with a Technical Engineering degree from Oklahoma State University and going to work in my grandfather's Ford dealership in Oklahoma. In my lifetime, I've acquired more tools than anyone could ever need, just because I love working on cars. My workers are no different. I employ professional auto technicians who show a deep concern for our customers' cars. They take the extra step to make sure everything is working on your car. My staff and I have the experience to take care of any car. I've been president of the Garland, Texas chapter of the Automotive Service Association and served three years as the Chairman of the Ford Dispute Settlement Board. But I'm proudest of being married to the same wonderful woman for over 30 years and am more proud of my children than any of my business accomplishments. And we aim to treat you like family, too. We make sure to provide high quality service to each customer. To us, that means taking the time to do each job right the first time, avoiding the shortcuts that sacrifice quality, double checking our work, noticing every area in need of repair, test driving every vehicle, and always ensuring your safety. 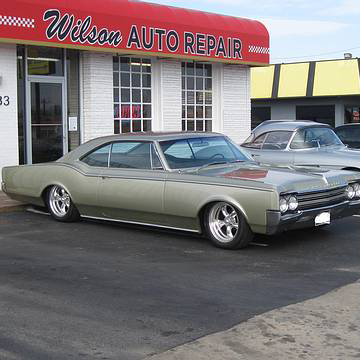 I hope you'll make us your classic car restoration and repair shop in Texas.